Cardinal Józef Glemp and renowned Polish Sculptor, Artist and Philosopher Jan Siuta were at Orchard Lake for two days of celebration and commemoration on Saturday and Sunday August 28 and 29th. They were there to unveil the two new markers to commemorate Msgr. Zdzisław Peszkowski who was known worldwide for his efforts to keep the Katyń Massacre in the public consciousness and to continuously pressure the Soviets in acknowledging their responsibility. The second marker was to commemorate the death of President Lech Kaczyński and all those who perished in the tragic plane crash at Smoleńsk on April10, 2010. In addition to blessing the markers Cardinal Glemp was to receive the Fidelitas Medal on Sunday during a luncheon celebrating the 41st Annual Ladies Day of the Orchard Lake Schools. On Saturday there was an exhibition of some of the works of Jan Siuta at the Cardinal Maida Library on the Saint Mary’s campus. This event was sponsored by the Polish Mission. There were some brief introductory remarks by Marcin Chumięcki who then passed the baton to Halina Malińska who was the individual responsible for organizing this event. Halina, who had met Mr. Siuta at the Blanka Rosenstiel annual International Polonaise Ball in Miami in 2006, was instrumental in his coming to the campus and having the markers sculpted. The exhibition was attended by over two hundred members of Polonia and their friends. Everyone had the opportunity to meet the artist and to meet briefly with Cardinal Glemp who was in attendance. There was a good deal of sparkling conversation in Polish and English. It was wonderful to experience the way in which the exhibition was brought together so that those guests who were not fluent in Polish could benefit from individuals who were more than willing to translate particularly when speaking to Mr. Siuta. 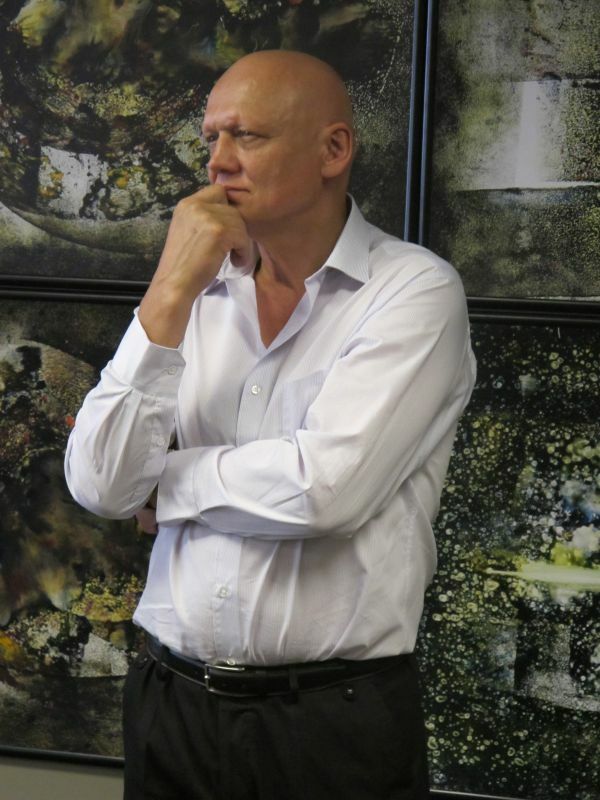 Mr. Siuta who was there for the whole of the exhibition was a gracious and charming conversationalist. 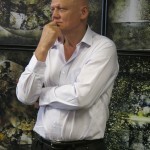 At a later date Tygodnik Polski will do an in depth article on Jan Siuta’s art and his philosophy. Much of the material was gathered at the exhibition.The memorial markers were created and donated by Jan Siuta. This is a wonderful gesture by this sculptor, artist and philosopher who has two galleries in Kraków. One is on 14 Sławkowska Street near the Rynek. Participating in the conceptualizing and the wording of the markers was Father Whalen and Halina Malińska. In addition to sampling some wonderful hors d’oeurves and delicious pastries the participants were entertained by noted actor and singer Andrzej Słabiak. His songs presented in a somewhat cabaret style were a delight to everyone. A number of his songs in addition to being well known to Polish audiences are international favorites. In addition to Polish he sang in Italian and English. Father Timothy Whalen, Chancellor of the Orchard Lake Schools, opened the art exhibition, greeted the guests of honor and proposed a very nice champagne toast to Cardinal Glemp and Jan Siuta, a toast which was enthusiastically endorsed by everyone. Father Whalen told a very interesting story about how some of the earth from beside the Katyń monument was ultimately placed on top of the casket of Msgr. Peszkowski by a Polish soldier in Warsaw as the casket was about to be sealed in one of the places of rest in the Shrine of Divine Providence (Swiątynia Opatrzności Bożej w Warszawie) in the crypt for famous Poles. The Shrine of Divine Providence is becoming the principle church in Warsaw and it is a great honor to be buried there. The earth for the Katyń monument at Orchard Lake from Msgr. Peszkowski’s burial was requested because for over two decades Orchard Lake St. Mary’s was Msgr. Peszkowski’s principal residence. In addition he commissioned the noted Polish Sculptor Marian Owczarski to create the memorial to the Katyń victims. Marian Owczarski’s creation is a powerful work in metal. It evokes the images of the suffering and the nobility of those who were executed at Katyń. The imagery cannot be fully described with words. It can only be fully experienced by viewing it in person. Halina Malińska did an absolutely terrific job in coordinating this exhibition. It was well attended and it had an international flair to it. In many ways this exhibition reflects a direction of the Polish Mission and its Director Marcin Chumięcki to involve Polonia and its many friends in ways that reflect the upward mobility of Poles and Polish-Americans both here and abroad. Halina was assisted in her efforts by a number of individuals who participated to create this wonderful exhibition. Some of the individuals who participated in bringing this exhibition to fruition were Henryka Olbrot, Jan Sikorski, Vice Rector Father Mirosław Król, Barbara Owczarski, and Leszek Rosik. Special mention should go to Irena Środek of Środek’s Deli and Bakery who prepared several special tortes and cheesecakes for the occasion. Tygodnik Polski wishes to express to each and every one of you our deep appreciation and thanks for all of your efforts in this very successful endeavor. The mass on Sunday was concelebrated by Cardinals Józef Glemp, Edmund Szoka and Adam Maida as well as a number of bishops and priests who were in attendance. The mass commemorated the Solemnity of Our Lady of Częstochowa. One of the great touches for this mass was the translation of the Cardinal Glemp’s sermon into English. It enriched the service for those who were not fluent in Polish as well as providing the opportunity to reflect more deeply on Cardinal Glemp’s words. This is another outstanding example of the insight “that as the thoughts of Poles are translated into other languages people will come to understand who we are at a deeper level and the Polish influence will increase appropriately.” In many ways Tygodnik Polski views this as a continuation of the legacy of Pope John Paul II. Whoever thought to do this should be commended. Cardinal Glemp’s homily was filled with many insights which reflected the transformation that occurred in Poland since the founding of the Saints Cyril and Methodius Seminary over 125 years ago. Let us briefly touch on several of his thoughts. As the Cardinal related, at that time Poles were being forced to experience russification, Kulturkampf and hakatyzm in partitioned Poland. Many of these Poles fled to America where Father Dąbrowski saw a need for a Polish Seminary to create priests who could minister to the needs of the increasing numbers of Polish emigrants in their own language. Today the Polish Seminary, in an interesting transformation, is receiving Polish speaking seminarians from a free and independent Poland and transforming them into English speaking priests who will serve in the different Archdioceses across the United States and the world. This is a remarkable transformation which speaks to the flexibility of Poles and Polonia and the energy with which they pursued their national goals of a free and independent Poland. Cardinal Glemp identified this energy as the “Polish Vitality”. After the Mass there was a procession from the Chapel to the Katyń Monument where the two markers commemorating Msgr. Peszkowski and victims of the Smoleńsk plane disaster were blessed. The ceremony was conducted by Cardinal Glemp. It ended with a singing of the powerful and moving Polish religious and national hymn Boże coś Polskę. This hymn is significant because during the Soviet occupation the wording was changed to reflect the hope for a free Poland. In many ways it was a dangerous hymn to sing particularly in the 1940’s and 50’s. Today the words reflect that Poland is free. Cardinal Glemp remained after the blessing so that the many participants could have their pictures taken with him. He was very generous to everyone. It was especially delightful to see his charming patience and delight as pictures with him and the children were taken several times as they are sure to become treasured memories with the enthusiastic children looking just right. The mass and the memorial were part of a series of daylong activities concluding with Cardinal Glemp receiving the Fidelitas Medal that was presented to him at a fund raising luncheon celebrating the 41st Annual Ladies Day of the Orchard Lakes Schools.